As a businessman, I love visiting Jo’burg’s business hubs of Rosebank and Sandton. It inspires me to dream bigger, work harder and be more determined. So, as a businessman or an international traveller, where does one find a haven in this wildly busy and noisy metropolis? The Residence, located in the leafy suburb of Houghton, would be my first choice. I find Johannesburg to be one of the most frenetic cities anywhere in the world. Everybody is always on a mission; people walk with determination and drive with assertion. Nobody seems uncertain or fearful despite, or perhaps because of the reputation of this crazy African city. One of the owners of this amazing Boutique Hotel is an architect and he evidently set out with a clear intention of creating an urban oasis and made this a wonderful place to stay. The high exterior wall in the tree and ivy-lined street give little indication as to the tranquillity and comfort found within. I spent a day and a night in a suite that offered all that I could possibly need. The M1, the city’s busiest highway, may only be a few blocks away, but from the depths of my extremely comfortable bed, I awoke to hear nothing, but the birds chirping and the fountains flowing. My stay was on one of the coldest nights of the year. Each of the public rooms had a cosy fireplace, deep sofas, warm lighting and bright smiles from the attentive staff. I spent much time assessing my busy day and planning for the next while sitting fireside with a single malt. I also took time to explore The Residence and found that it had beautiful gardens, a tennis court and three swimming pools, one of which is heated. Summer must be an absolute pleasure here. The Boat Lounge is beautifully decorated with nautical artefacts. The wood-burning fire ensured that the room was cosy despite the large windows overlooking the misted garden. The Piano Bar, adjacent to the restaurant, I enjoyed most, as the baroque décor, ambient lighting and well stocked bar where perfect on the dark cold evening I visited. Perhaps the best feature of The Residence is the roof-top Spa. It is a delightful mix of potted plants, dark wood, white chairs, bright cushions and light rugs. Most surprising of all is that it offers magnificent views of Johannesburg. There are four treatment rooms, including a couple’s suite and a private suite. A Jacuzzi, sauna and a steam-room are also available for your pleasure. The dining room is sheer opulence, including linen-draped tables with neatly-arrayed cutlery and sparkling glasses. Expect great service from the waiting team. I enjoyed one of the best Ostrich Steaks I have ever had for dinner. Breakfast was delightful with everything from fresh oysters to warm bread. My eggs benedict was superb. The Residence is a seamlessly interlinked boutique hotel spread across three of the large Houghton plots. The gardens are manicured and all 18 rooms are north-facing. These range from luxury single rooms to the Madiba Suite with its own library to the Residence Villa, which can be booked with all five suites to ensure privacy for a group. There is also a 15-seater conference room as well as a private dining area called The Ballroom. It seats 18 people and the menus are custom-crafted to suit your every need. For transfers, expect to be chauffeured around in a Rolls Royce or an E and S-class Mercedes, as well as a Mercedes Viano. The Residence is an oasis of tranquillity and security in the heart of one of the craziest cities in the world. Once through the gate, you may as well be in Shangri-La. 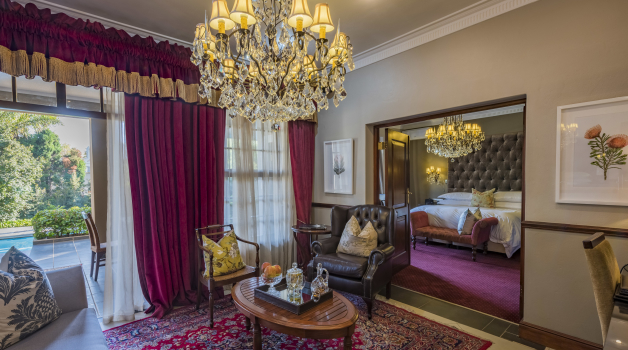 For more information on this award-winning boutique hotel, visit https://theresidenceportfolio.co.za or call 011 853 2480.